Nanjing Watex Tech Co., Ltd.
Shanghai Miaoke Precision Machinery Co., Ltd.
Cangzhou Yi Sunda Mechanical Technology Co., Ltd.
Liaoning Wanlin Technology Co., Ltd.
Dalian Mingcheng Industry Co., Ltd. The feature 1. Good Working stability , high frequency interfere effectively plasma, lightweight portable, the structure and design is contracted. whose vision is to offer the best service , quality & price to our clients all over the world. Our portable cnc flame/plasma cutting machine has been export to some countries,and have got some countries approved, We will waiting for your cooperation Dalian Mingcheng Industry Co.
Harbin Qian Fan Xi Feng Machinery Co., Ltd.
Weifang Yunneng CNC Equipments Co., Ltd.
Shanghai Electric Heavy Machinery Co., Ltd.
Guangzhou Perfect Machinery Technology Co., Ltd.
Shanghai Tayor Heavy Industry (Group) Co., Ltd.
Jinan Robotec Machinery Co., Ltd.
Shandong Jiaxin Machinery Equipment Co., Ltd.
Shandong WAMI CNC Technology Co., Ltd.
Ningbo New Kanzo Electrical Co., Ltd.
Jiangsu Fedjetting Tech Co., Ltd.
Foshan Bao Tao Machine & Equipment Co., Ltd.
Foshan Yuanli Precision Machinery Co., Ltd.
Jinan Xieqi Mechanical Equipment Co. Ltd. Samples Q1:How can i get the best machine9 You can tell us your working material,detail work by picture or v ideo so that we can judge whether our machine can meet your need or not. Q2:This is the first time i use this kind of machine,is it easy to operate9 We will send you manual and guide v ideo in English,it can teach you how to operate the machine. Q4:What&rsquo;s the guarantee,in case the machine breaks down9 The machine has one years guarantee,if it breaks down,generally speaking ,our technician will figure out what the problem may be. Dezhou Tongyuan Import & Export Co., Ltd.
Tianjin Henghua Pipeline Technology Co., Ltd.
Shanghai Yuanhong Ultra High Pressure Waterjet Technology Co., Ltd.
Foshan Yongshengda Machinery Co., Ltd.
Nanjing Rongwin Machinery Technology Co., Ltd.
5 axis waterjet machine, water jet cutting 5 axis, cnc water jet cutting machine The Dynamic 5 axis water jet cutting machine is specially used to cut marble and granite, it can compensate 10&deg; cutting angle. Due to the water jet cutting is a way of flexible cutting, therefore the product cross section after cutting by the traditional 3 axis water jet cutting machine will have a certain degree of inclination. 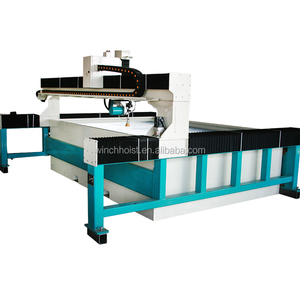 However, our 5 axis water jet cutting machine can ensure the accuracy of vertical cutting section by compensating the cutting angle, without reducing the cutting speed. Foshan Hairan Machinery And Equipment Co., Ltd.
Water Jet Cutting Machine has been an impressive product in the Metal Cutting Machinery market over the past year, and it was very popular in India,United States,United Arab Emirates,Canada and Pakistan; As shown in the distribution chart, market shares of these countries are folowing: [ IN:19.98%, US:15.23%, AE:6.41%, CA:3.55%, PK:2.52%, other:52.32%]. 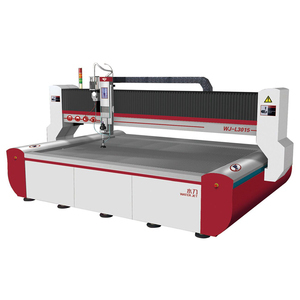 What's the trends of Water Jet Cutting Machine product's market in 2018 (Dec 2016 to Jan 2019)?we have studied one years data on online sales, global shipping, search, sourcing and requirements of following products Water Jet Cutting Machine. Spare Parts Of Water Jet Cutting Machine. Water Jet,Here is the report.During the research period (Dec 2016 to Jan 2019), Both global demand and supply indices of Water Jet Cutting Machine have increased by 1.03, 3.33; which indicates that the future is very optimistic. 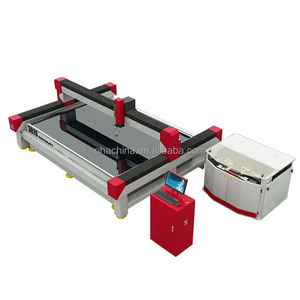 Despite a little decline in Online Sales Index, Retailers still have a big opportunnities and more bargaining and choice because of the strong market supply and demand.Water jet cutting machine is normally an interesting product. Alibaba.com is the most important platform for Water jet cutting machine product online whole sales, most of the golden suppliers on the platform comes from Shandong, Jiangsu, Guangdong in China(Main Land), they produce qualified Water jet cutting machine Water jet cutting machine with certifications as iso, ce iso or ce and support OEM and customized designs.